On March 12, 1928 at approximately 11:57 pm, the St. Francis Dam broke. 12.4 billion gallons of water that was supposed to fill the sinks, bathtubs, and mouths of Los Angeles residents was now surging down the San Francisquito Canyon. At 11:58 pm, the power lines surrounding the dam snapped and powerhouse number two was destroyed, darkening the surrounding towns at a time when they desperately needed some light. At 12:03 am, the 140 foot wall of water flattened the makeshift town next to the dam that housed the workers (and their families) hired to build and maintain the dam. By 1 am, the water had obliterated bridges, flooded roads, and killed 150 people. By 2 am, sirens were echoing across the area warning people of the incoming water. Citizens scrambled to higher ground. Finally, at 5:30 am, the over 12 billion gallons of water found an escape. After a 54 mile journey, the water poured into the Pacific Ocean, carrying with it debris, livestock, shattered homes, hundreds of bodies, and the career of one of the most celebrated civil engineers in American history. As a born Irishman, William Mulholland was always fascinated by water. He lived in Ireland until the age of 15 when he couldn’t take his father’s beatings anymore. He ran away and joined the British Merchant Navy. His love of sea kept him traveling via boat to Pittsburgh, where he lived with his uncle. Adventure kept calling and Mulholland made his way west, where he stopped in San Francisco before arriving in his new home, the City of Angels. In the 1880, Los Angeles had just become an incorporated city thirty years prior. The railroad had only recently arrived, bringing an influx of people. This was a new western city and there were more than a few civil services that still needed to be provided. Getting water to the city’s citizens was one of them. Mulholland was hired as a “zanjero,” someone who dug and maintained water ditches to distribute the valuable commodity to the community. The Los Angeles River was the main source of water for the city, but as the city grew, so did the demand for water. The Los Angeles River alone wasn’t going to cut it and Mulholland knew it. With his downtime and meager savings, he bought books and educated himself on geology, engineering, mathematics, and hydrology. He impressed his superiors and quickly rose through the ranks, from ditch digger to foreman to superintendent. In 1902, the city officially formed the Los Angeles Department of Water and a self-taught and self-made William Mulholland was named Chief Engineer. Soon after his appointment, Mulholland and mayor Frederick Eaton began what would become known as the California Water Wars. They knew the city needed water and Owens Valley, 222 miles away from Los Angeles, had it. Through shady business deals, deception, lowball offers, lying, and outmaneuvering the federal government, the pair were able to secure the water rights of Owens Valley for Los Angeles. Now they just needed to find a way to get the water to travel the 222 miles to it’s big city neighbor. In 1908, construction on the Los Angeles Aqueduct began under the direction of William Mulholland. “There it is. Take it.” When Mulholland uttered those words on November 3, 1913 at the opening ceremony of the Los Angeles Aqueduct, it certainly encompassed the mentality of the city government in regards to water. Stretching 233 miles and costing $23 million (adjusted for inflation, would cost over $530 million in 2013), the LA Aqueduct was the world’s longest and most ambitious such structure. It was a notable achievement in civil engineering, but that didn’t mean everyone agreed about its existence. Right when it first opened for water business, radicalized farmers from Owens Valley, mad about their water being taken from them, tried to sabotage the aqueduct. Through dynamite and damming, the farmers made Mulholland realize that he needed reservoirs of water on hand for his city in case the aqueduct ever went out of commision. Throughout the city, he chose six locations for reservoirs. Buried deep in the San Francisquito Canyon, the St. Francis Dam was to be the most ambitious. Construction on the St. Francis Dam began in 1924 and was finished in 1926, way ahead of schedule and under budget, a tendency for a Mulholland-led project. On May 13th, 1926 with very little fanfare, the gate opened and the reservoir began filling up. The dam filled at a rate of 70 million gallons a day until it topped out, holding upwards of two years’ worth of water for the city. Additionally, there was hope it would become a tourist attraction, a place where people could marvel at another Mulholland miracle. Less than ten months later, cracks, both figuratively and literally, began forming in the dam. 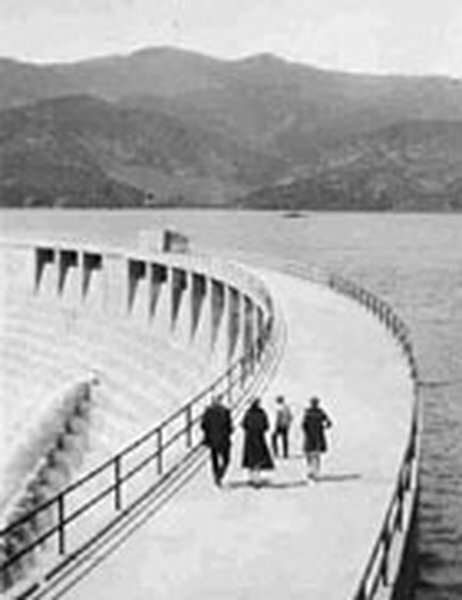 Mulholland was a frequent visitor to the site, routinely inspecting the dam and being debriefed by the damkeepr Tom Harnischfeger. Harnischfeger was a constant presence, living in a cabin next to the dam with his young son and girlfriend. Mulholland, though, was never too concerned with the cracks Harnischfeger reported, chalking them up to temperature changes and normal material contraction. On the morning of March 12, 1928, Harnischfeger was doing his normal rounds when he discovered a crack that was leaking water with a muddied color. This was concerning to Harnischfeger because it had the potential to mean the water was eroding the foundation of the dam. He immediately called Mulholland to come take a look. Mulholland arrived quickly, but determined the leak was nothing to be worried about. He arrived at the conclusion that the muddy look of the water was due to work that had been done recently that left a considerable amount of loose soil in the area. After a brief inspection of the entire dam, Mulholland returned to Los Angeles confident there were no major problems and his water was safe. Hours later, this proved to not be the case. At 11:57 pm and approximately thirty seconds, the dam broke. Tom Harnischfeger and his family were the first victims. As daylight came and the devastation of the water’s 54 mile journey was revealed, it became apparent what a tragedy this was. Over a thousand homes obliterated and approximately 450 lives lost. It was the greatest failure in American civil engineering history up to this point. Search and rescue began immediately. Tractors sorted through the rubble, hoping to find survivors. More often than not, they didn’t. Aid and volunteers came out in droves. They worked into the night, with Universal Studios providing giant spotlights usually used only for the movies. There was an initial belief that Owens Valley saboteurs were behind this horrific act, but after a brief investigation, it became clear that this was result of a flawed dam. William Mulholland was devastated. While a city mourned and attempted to rebuild, Mulholland tried to figure out what went wrong. Shaken to his core, he was repeatedly questioned about how this could have happened. Various committees and the Coroner’s Inquest revealed that the floor of the canyon, filled with reddish, soft dirt, should never have had a dam built on top of it. Many years later, it was discovered that the canyon was the location of numerous ancient landslides, something that engineers from the 1920s would have never been able to know. William Mulholland retired from the Department of Water in November 1929, a mere eight months after the St. Francis dam broke. He would pass away less than six years later, heartbroken and with a legacy forever tarnished. On March 12, 1928, just before midnight, it collapsed and sent over twelve billion gallons of water roaring down the valley of the Santa Clara River. Over 450 lives were lost in this, one of California’s greatest disasters. It really wasn’t a “makeshift town.” A large crew assigned to build a Southern California Edison transmission line across the valley had a tent city several miles below the dam site. Some survived, but most died in the disaster. I visited the site accompanied by a guide who was one of the first Bureau of Power & Light employees to reach the disaster in search of survivors. He died in 1986. There is a well written and researched book on the disaster, which explains that after the 1906 earthquake, this tragedy happened to be the second greatest loss of lives for the State of California.